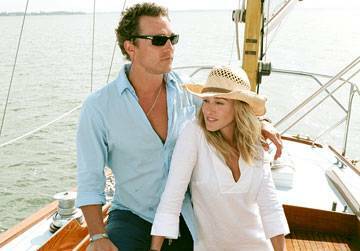 "Failure to Launch" is about a 35-year-old man named Trip (Matthew McConaughey), who still lives at home with his parents. They dream of being empty-nesters and hire a woman named Paula (Sarah Jessica Parker), who is a specialist at getting grown men to move out of their parents' homes. It is a good romantic comedy. This movie has numerous environmental scenes and a black plot/character subtext. The main characters sail, surf, bike through forests, and rock climb. Tripp is constantly being bitten - by a chipmunk, a lizard, a dolphin. The idea is that he's not at one with the natural order and the animals know it. That is why they bite him. In one scene Trip and Paula have a 9 year old black kid sitting between them who is either Trip's kid from a previous relationship or the child of Trip's former black fiancee, who died. None of about 20 reviews we examined talk about this relationship.